Any time is a good time to experience greatness and the same goes for the Great Wall of China. It poses a beautiful spectacle all the year round. However, the crowd and the weather changes from one season to another and hence it is important to know when you can enjoy the marvel without any hindrance. Most tourists visit The Great Wall from Beijing. Hence, in this article, we've concentrated on that area. Feel free to contact us to know the details if you are visiting the Wall from any other place. If you like a bit of chill then you ought to visit the Wall during spring. The weather is really enjoyable with temperatures hovering around 11-24°C (52-54°F). The plants in the mountains remain green and flowers start to blossom. You can enjoy the real environment of an ideal spring season here. Although it might get windy sometimes, so beware of that. The mountains will be cooler than the city, hence do carry a warm jacket while going on the trip. The first week of May is holiday season in China and packs of Chinese tourists flock to see the Wall. We strongly recommend avoiding that time to plan any trips. Are you sick and tired of the cold and want to enjoy the sun? 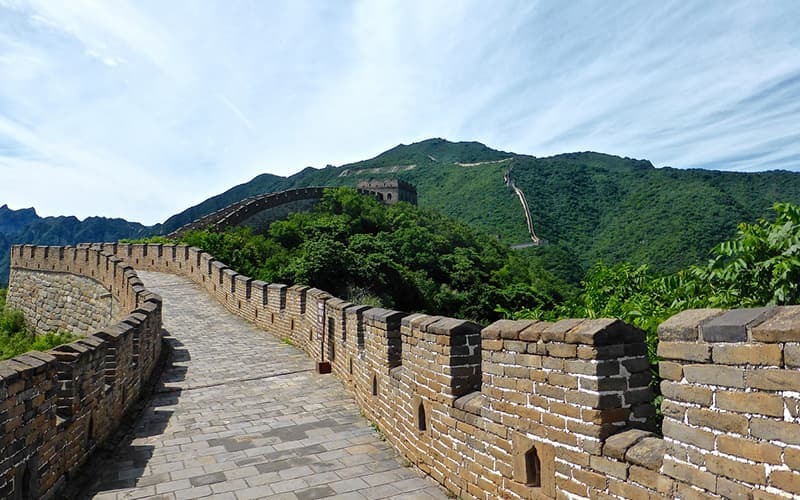 Then you can choose to visit The Great Wall during summers although, there are many things you should be aware of. The summer temperature near Beijing is quite high, usually around 30°C or 86°F. Since The Great Wall is located in the mountains, it will be cooler, than the city itself. July and August are the rainy seasons, definitely not recommended. It is not fun to hike wearing raincoats and carrying umbrellas and being scared of thunderstorms. The mountains get ornamented with blooming flowers and dark green plants. The grey colour of The Great Wall provides quite a contrast and it is a magnificent scenery indeed. While packing, do remember to take things to protect you from the sun - sunglasses, sun block cream, umbrella, hats - anything that you like. Also, carry an umbrella or raincoat to keep the rain away. However, pack light since you will have to do some hiking. Another important thing to note is that summer is the peak tourist season and hence the hotel rates are higher. The Great Wall remains crowded with tourists. We strongly recommend making all the bookings beforehand. The best season to visit from Beijing is fall which is between September to November. Comfortable temperatures coupled with less rain and clear skies present the best combination to enjoy the trip. 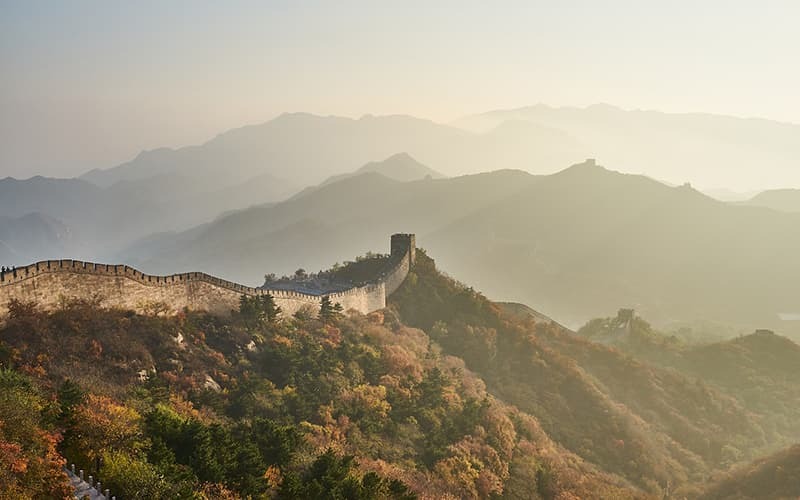 Clear skies can help see the wide expanse of The Great Wall. Temperatures remain around 8-18°C (46-64°F) around this time. You can experience a burst of colours in the valley, a one of its kind spectacle indeed. Temperatures can sometimes drop sharply around this time, hence, don't forget to pack a jacket for the trip. China celebrates its National Day in the first week of October where locals spend a day visiting the Wall. Avoiding this time would be wise. Picture: autumn red leaves and fall colors in early October. December to February is winter where temperatures drop sharply, often below the freezing temperature. If you want to enjoy the Wall in the backdrop of white snow, this could be your season. Carry all the required protective clothing to keep the chill at bay. You might need to wear snow boots to manoeuvre your way through. 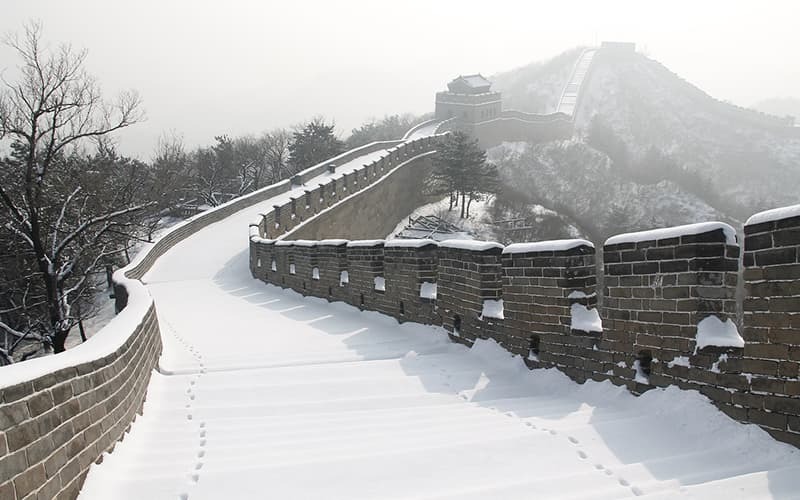 The Chinese New Year falls in winter and is a time when the locals visit the Wall. We recommend avoiding this time for planning your trip. For detailed information on the best seasons to visit, you can contact us. Our advisers will be glad to be of assistance. See our most popular China tours as below.